James Foley writes and illustrates for kids. He makes picture books, junior fiction and graphic novels. He is in high demand for talks and workshops in schools and libraries across Australia. He comes from a long line of queuing enthusiasts. He lives in Perth with his wife, son and labrador. Visit the photo page for more headshots. James Foley makes picture books, middle grade novels and comics for kids. 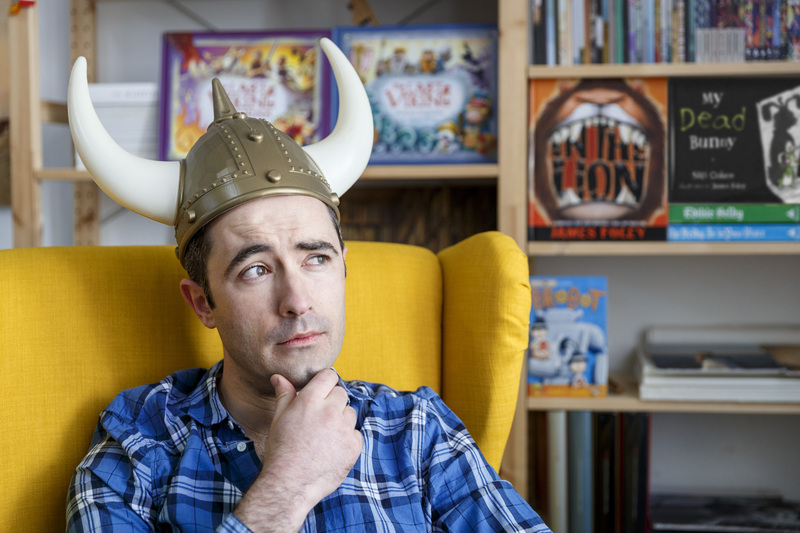 He’s the author/illustrator of the S.Tinker Inc graphic novel series for middle primary: Brobot (2016), Dungzilla (2017) and Gastronauts (2018) star Sally Tinker, the world’s foremost inventor under the age of twelve, and Joe Tinker, her stinky baby brother. James also illustrated Total Quack Up (2018), an anthology of funny short stories written by authors such as Paul Jennings and Jacqueline Harvey, with proceeds going to charity. James’ earlier books My Dead Bunny (2015) In The Lion (2012), The Last Viking (2011) and The Last Viking Returns (2014) have all scored several honours, including children’s choice awards, shortlistings in the Children’s Book Council of Australia Book of the Year awards, and selection to the International Youth Library’s White Raven list. James is an an ambassador for Books In Homes and Room To Read. He is a massive Marvel movie nerd. He comes from a long line of queuing enthusiasts. Hi, I’m James. I’m a writer, illustrator and cartoonist. I run workshops and give talks. Most illustrators will tell you they’ve been drawing for as long as they can remember. I started my career in primary school, drawing cartoons for the school newspaper. The paper only lasted one issue, probably because my class faked a fire in the school hall using a smoke machine to get our front page story. In year 7, I won third prize in a state-wide ‘Make Your Own Storybook’ Competition. I later worked on a regular comic strip for my high school paper; editorial cartoons for a Curtin University paper; and a full-page comic for Notre Dame University’s ‘Quasimodo’ magazine. But my professional career really began in 2003, when I drew my first covers for Western Australia’s weekly ‘Quokka‘ newspaper. By the time I finished in 2010 I’d drawn nearly 300 full-colour cartoons, usually featuring local landmarks and events. I’ve worked as a freelancer, creating cartoons and illustrations for clients including Caritas Australia and the State Child Development Centre. I’ve consulted and volunteered with community groups and non-government organisations: working with children with special needs at Disability in the Arts Disadvantage in the Arts Australia (WA), assisting Indigenous artists through the Wirlomin Noongar Language and Stories Project, and teaching students in country towns through the Rural Development Australia (Wheatbelt) “Sharing Stories” comic project. My favourite part of the job is presenting workshops at schools and libraries. I’m always amazed at the natural enthusiasm children bring to drawing, especially when they draw just for themselves and don’t care if it’s ‘good enough’ or not. I believe we all have this enthusiasm when we are younger, but most of us lose it – maybe someone makes a nasty comment, or maybe we think someone else is better at it, or maybe we think we have to draw things that look ‘right’ (I still struggle with this last one). I’ve worked with older audiences too, including educational organisations and corporate groups, and it’s fun to see people get back in touch with their creative child. I’m a member of the Society of Children’s Book Writers and Illustrators Australia West chapter. I’m also a member of the Australian Society of Authors and the Children’s Book Council of Australia. I like working with pen and ink, pencil, charcoal and watercolour. I also use digital tools: Adobe Photoshop, a Wacom graphics tablet, an iPad Pro and the Procreate app. Great singer too! See you att eh SCBWI Conference with the SCBWI BAND! Cheers Susanne 🙂 See you then. Hi James, loving your illustrations so much and will be including you in this month’s celebration of Australian picture book illustrators on facebook. Hi Lesley, thank you for your support! I’ve got my own Facebook page at Facebook.com/jamesfoleyillustrations ; have you seen The Last Viking’s Facebook page too? http://Www.facebook.com/KnutTheLastViking (I’ve been posting behind-the-scenes stuff for ‘The Last Viking Returns’ which comes out in September). Yippeee! Great work you’ve done so far, and congrats on making it on the shortlist for 2016’s Picture Book of the Year for My Dead Bunny!!! Also love its trailor on youtube. Haha. Keep up the wonderful work you do and, most importantly, thank you for encouraging our young generation to read!!! hi James Foley I think that you are the best i have seen you in real life and hope to see you again soon please reply back to me when i comment. BYE I LOVE YOUR BOOKS . Im also entering your brobot competition. hi James Foley i am one of the students you visited at South Lake Primary our librarian once your book Brobot came out she ordered lots of books when the library opened everyone wanted a copy of bye. LOVE YOUR BOOKS! Sorry for the late reply, Jireh! Good luck in the Brobot competition. I hope you like reading Brobot! Hi! I was a student who got to talk to you from a school you visited. I was super inspired by your speech and tips, that I am recreating a book plot I came up with at the start of the year. I enjoy your books a lot!